It's another great challenge at Sweet Stamps . Our challenge theme for this week is Easter . I love this image- and started out embossing on Vellum and was going to color it in, but I decided to try embossing the image with a variety of Embossing Powders, and I decided I like the sparkly look on the rich purple cardstock. The embossing powder has sparkle to it- and I cut out a thin layer of white shimmery cardstock beneath it. 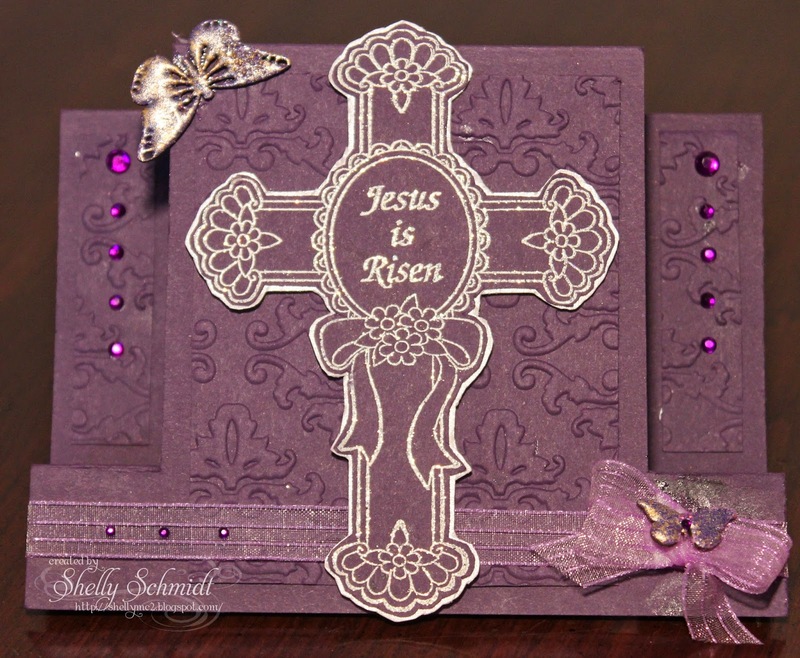 There is a layer of embossed purple cardstock behind the cross too- I layered it all up on a Center Step card. And this is the Royal Sterling EP on another white shimmery cardstock (also from Paper Temptress). This is very shimmery IRL too. I decided to leave this CAS as well. Here is a direct link to the Monthly Challenge as well- 3/15-4/14 Inking w/markers. You have a chance to WIN- winners drawn by Random.org. Beautiful cards Shelly - is that cross and ODBD stamp? 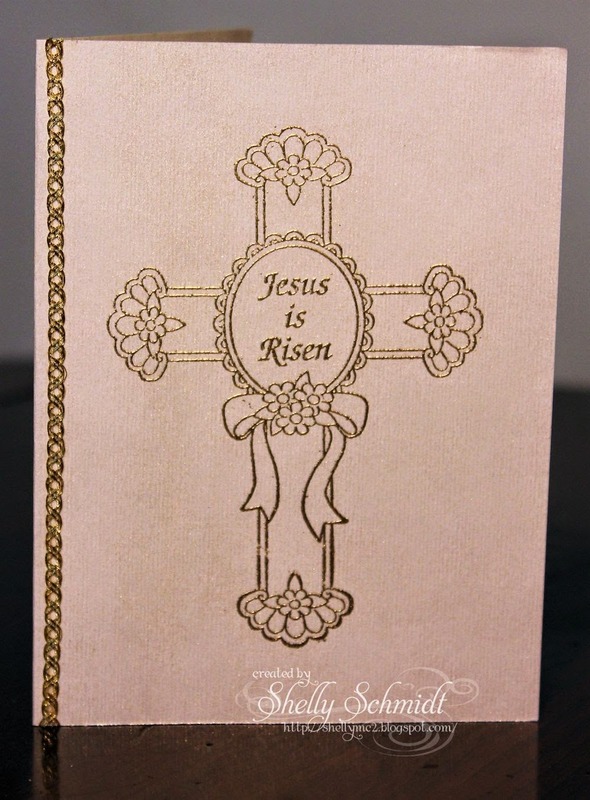 Beautiful and elegant Easter card. The embossing is perfect. Thanks for joining the Craft-Dee BowZ April Challenge. What a lovely cross. Great card! OH my stars, my jaw just hit the ground - Shel, this is a positively beautiful GEM of a card! WOW!!! So elegant and beautiful!!! Lovely cards. Simple and elegant -- always a great combination. Thanks for joining the Craft-Dee BowZ challenge for April. Three gorgeous card!!! I love the embossing on the shimmery cardstock. What a gorgeous image. Love the shimmery look to it!! they are all beautiful Shelly I like how you showcased that image 3 different ways. Shelly your cards came out beautiful! Very Elegant! Thank you sharing with all the details!! Pretty cards. My favourite one is the purple. It is so gorgeous, and I like the center step design you used. Very Sweet card Shelly!! it is always so interesting to see how we each work color into an image!! Thank you for the group plug too!! I love these elegant Easter greetings. You chose a wonderful shade of purple for your step design. Gorgeous work Shelly!! What a beautiful step card! Perfect for Easter! Shelly, this is gorgeous! What a wonderful Easter card. I love the step card idea. Beautiful cards! For some reason,I always get attracted to cards made with a cross. I have one with a cross on my blog too. Hope to link up to the Easter challenge. The purple card is very elegant and I love your choice of monochromatic colours. An elegant collection of Easter cards. Lovely collection of Easter cards. How very beautiful they all are. Thank you for showing the really different ways of using an image for very pretty and uniquely different cards! Very lovely cards. They look great with the image. Three wonderful designs. 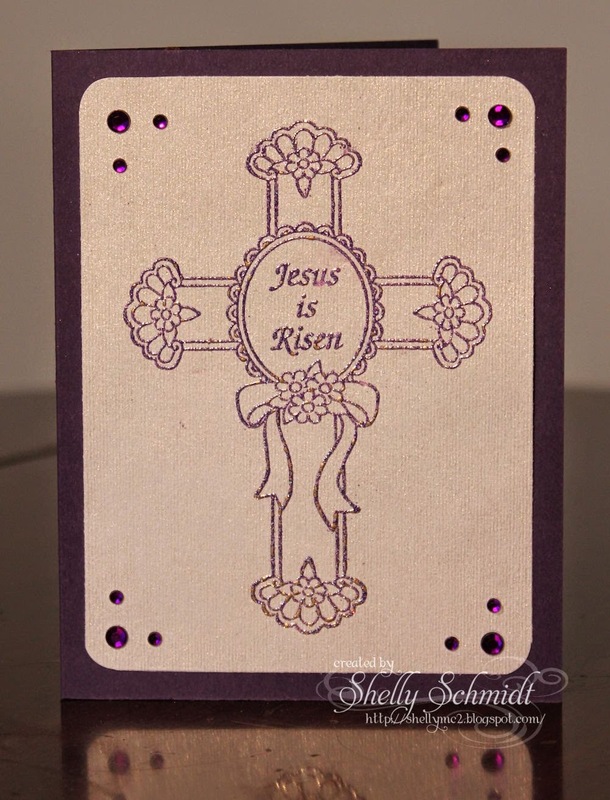 Love the simple design of the 2 cards and love the gorgeous design of the purple cross on the step card. Awesome! !